This will be the future home of projects for Woodturner PRO and Lamination PRO. It is our intention to start making new projects that use various features of our software. We will target users at all skill levels. If you're just beginning, we'll have projects for you and if you've been making segmented projects for years, we'll see if we can't steer you in some new directions. If you have suggestions for new projects or wish to submit one of your own, please let us know. 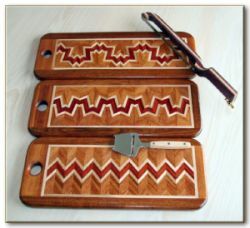 This project was designed to introduce you to the unlimited design possibilities available by applying your woodworking skills to laminated boards. This project is actually three projects in one. You might choose to stop at a 1st generation board which would be the perfect introduction to working with laminations. Making a 2nd or 3rd generation cutting board is a great way to learn new techniques and improve your skill. This project was designed to introduce you to the unlimited design possibilities available by applying your woodworking skills to laminated boards. We could have started with a simple chevron pattern. We could have even gone one step further to a 2nd generation design. 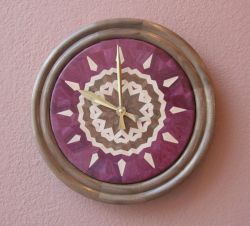 But why not go all the way—a 3rd generation board, cut into radial segments to make a Sweetheart Clock. You’ll find that it is far easier than you’d expect. With this project, you’ll challenge yourself, learn new skills and you’ll make a treasured keepsake for you or a friend.